Areas without sewer connections in commercial zones are flushing away potential property tax revenue they would create with the right infrastructure, would-be investors say. Sewer systems would mean more buildings, investment, jobs, tax revenue – all the pieces needed to grow an economic base, they said. He owns land at Northwest 69th Street and 35th Avenue where he wants to build. But that property has “just become a storage area,” he said, because of the prohibitive cost of one of the most important aspects of the building process – figuring out how to handle the plumbing. “I have vacant land and would like to expand our building, but can’t,” said Mr.Wyatt. The nearest sewer connection would have to come from three blocks away at Northwest 32nd Avenue and would cost about $100,000, a factor that restricted his investments. 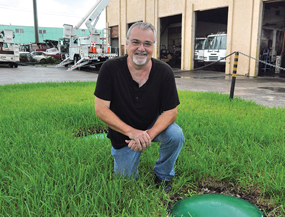 Mr. Wyatt has been in business since 1978, and said he was instrumental in helping to get the City of Hialeah to bring water service to the area. “But somehow we got skipped over when it came to sewer,” he said. More than 30 years later, business owners say they either rely on septic tanks or increase their costs by tens of thousands to connect to the sewer system. County commissioners have been addressing the issue, thanks to initiatives like Jean Monestime’s resolution to connect businesses in unincorporated areas the county’s sewer system. And in this year’s county budget, two sewer extension projects got funding from General Obligation Bonds. One extension, which will cost about $2 million, runs from Red Road to Ludlam Road along Bird Road, said Douglas Yoder, Miami-Dade County Water and Sewer Department deputy director. “It is an area that is limited in the type of development that can happen there because of the fact that it’s not on sewers,” Mr. Yoder said. The other extension goes from north of US 1, west of Southwest 67th Avenue and south of Southwest 72nd Street. The Water and Sewer Department is continuing work, meanwhile, on a study to examine the extent of the scarcity of sewer infrastructure and the cost to bring service to underserved commercial and industrial areas. The report is set to be complete within the next month, Mr. Yoder said. For his part, Mr. Wyatt would like the sewer lines from Northwest 32nd to 35th avenues and 67th to 69th streets in the West Little River community to facilitate his business expansion. Two weeks ago, Eltec Construction CEO Elrod Phillips told Miami Today that his cost to bring three franchise restaurants to that same community would increase about $30,000 because of lack of sewer infrastructure. He was working with Commissioner Monestime to find a solution.